Excuse the absence from the blogasphere, but Bill and I finally went on our honeymoon - three weeks spread across Croatia and Greece! For someone who has only taken 4 consecutive days off from work in the last three years, a three week vacation was something from another world. I have never unplugged from work and relaxed as much as on this trip - but more on that later! This post is all about stepping up my cooking game. After 3 weeks traveling, and a week on either end, gearing up and packing, unpacking and running errands, I haven't been in the kitchen much, or inspired when I am in the kitchen. Starting this week, it is all about getting back in the swing of recipe planning and being inspired by what is already in the fridge. 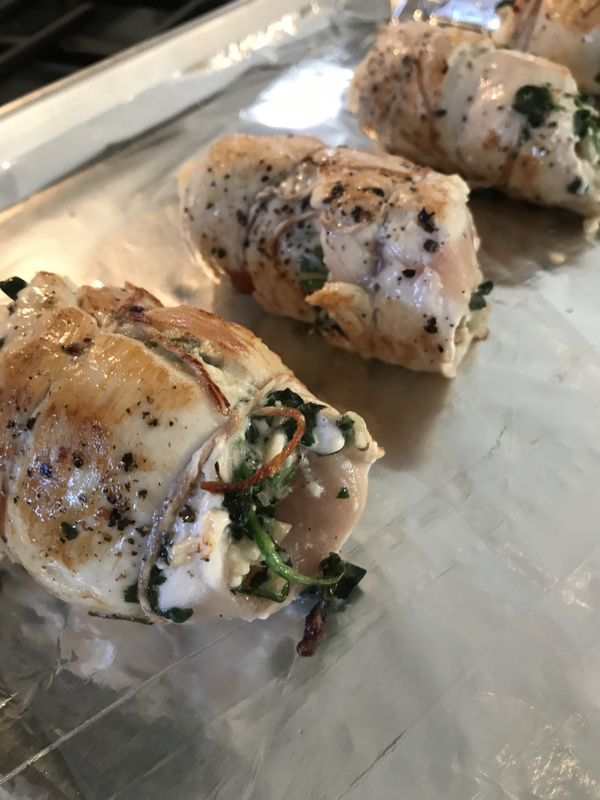 These stuffed chicken rolls are an easy star component for a flavorful dinner, you can pair with veggies to keep it light, or add creamy potatoes to complete a rich and unforgettable meal. What are your favorite side options? In a large sauté pan over medium high heat, add 1 tablespoons olive oil, onion, and garlic and sauté until tender about 2 minutes. Add the spinach, a little at a time, allowing the spinach to wilt a little with each addition, season with Kosher salt and freshly ground black pepper. Remove from heat, and allow to cool to room temperature. Using a paper towel, ring out any excess moisture from the spinach mixture. Roughly chop the spinach mixture and add to a medium bowl, along with the feta cheese salt and freshly ground black pepper and chili flakes, if desired. Fold together until combined. Season the chicken breasts with salt and freshly ground black pepper. Divide the spinach mixture evenly among the 4 chicken breast halves, keeping the filling away from the edges. Beginning at the narrower end of the chicken slice, roll up, enclosing the filling as you would a jelly roll. Tie with kitchen twine every inch to secure. Repeat with remaining chicken breasts. Heat the remaining 1 tablespoons of olive oil in a cast iron skillet, over medium high heat and add the chicken. Rotate to evenly brown on all sides, about 6-8 minutes. Place in oven, bake until a thermometer registers to 165ºF on the thickest part of the chicken, about 10 minutes. Remove from oven. Let rest 5 minutes. Cut the twine and slice into 1-inch pieces.